Washington’s initiation of a new game on the Korean Peninsula has become an important element in the overall process of reformatting the political map at global and regional levels. A long time coming, this process has sharply quickened with Donald Trump’s rise to power in the USA, with this message addressed to allies: “Guys, that’s enough coasting on our account. We’ll work on our own problems, and from now on you get by as well as you can manage.” The desperate wails: “Who are you leaving us for? Come back, we’ll forget all of this” remain unanswered. Distinct among the choir of the “abandoned,” is the voice of Japan – the USA’s key ally in Asia. With that, this process of “separation” between the two allies has so far affected the political and economic spheres, but not defense. At every convenient opportunity, the two sides continue to repeat the mantra of the cornerstone of the Treaty of Mutual Cooperation and Security between the United States and Japan of 1960. Yet again, this mantra was voiced during the latest visit to Tokyo (on June 29) by US Secretary of Defense James Mattis. During discussions with his Japanese colleague, I Onodera, it was also stated that restrictions on American-South Korean exercises are not spill over to joint military exercises of the USA and Japan. However, reducing tension in Northeast Asia, affects the Japan’s current defense measures. So, by order of the same I. Onodera, in early-June there was a lowering of the readiness threshold of missile defense destroyer systems, deployed in the Sea of Japan with the goal of countering a hypothetical missile attack by the DPRK. Another notable event, occurring immediately after the American-North Korean summit in Singapore on June 12, was certain contacts between Japanese and DPRK diplomats in Ulaanbaatar after the Northeast Asia security conference held there in mid-June. We should note that up to this moment, Japan was perhaps the strongest supporter of the position that Pyongyang should be given no positive signals before conducting “total and verifiable” nuclear missile disarmament. In particular, Tokyo’s first reaction to the results of the summit in Singapore (above all, to the decision to suspend American-South Korean exercises) carried a rather wary character. Now there is talk about possibility of holding a meeting of Prime Minister S. Abe and Kim Jong-un in September of this year at the annual Eastern Economic Forum in Vladivostok. To a certain degree, this reflects the trend of “untangling” Japanese foreign policy from the USA in reaction to the above message from Trump and his new policy towards the Korean Peninsula. In these emerging, basically new conditions, Washington will no longer have grounds for blocking Tokyo’s autonomous course in relation to the DPRK. As it was four years ago, when, under the pretext of solving the notorious “abduction problem,” Japanese diplomacy quickly fostered contacts with North Korean colleagues on various neutral territories, including the very same Ulaanbaatar. Japan’s “untangling” from the USA in the sphere of foreign economic activity is becoming more evident. Not in the sense of interrupting (highly favorable for Japan) economic relations with one of its main trade partners. Strategies for economic relations with the outside world have taken on a fundamentally different character. The Trump administration prefers bilateral relations, while Japan is entering into the creation of a multilateral structure and continuing the process of the globalization of world economic relations. In this regard, the completion of the Japanese parliament’s ratification process at the end of June of the Trans-Pacific Partnership, from which Donald Trump withdrew the USA with his very first order as president, has become symbolic. The general desire to continue the process of the formation of a multilateral, intergovernmental economic construction is becoming one of the main reasons for the positive trends which have been emerging in recent months in Japanese-Chinese relations. Earlier we noted the remarkable fact of a meeting (the first in 8 years) of the Prime Ministers of Japan and China, along with the president of South Korea held in Tokyo from May 9-11. As it happens, the main theme of the negotiations was various integration projects involving all three leading economies of Asia. New Eastern Outlook has more than once discussed the “Nanjing Massacre” in the context of modern Japanese-Chinese relations. 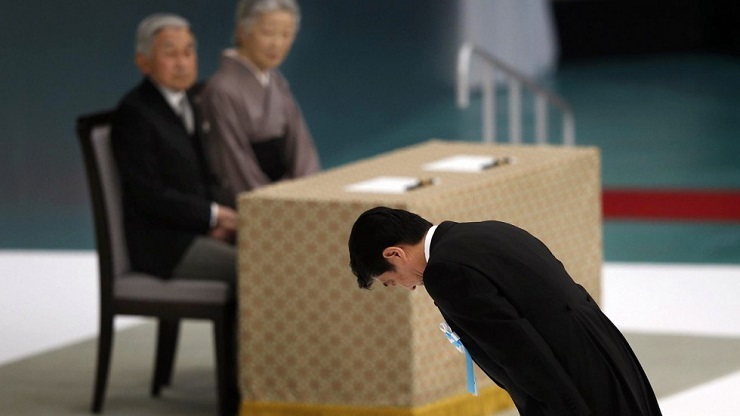 Here was noted the desire for further development of a symbolic gesture from the side of Japan’s current leadership on this point of commemorating the victims of these events. The Chinese would have been satisfied with the silent (that is, without unnecessary words) presence at this place of the current Prime Minister of Japan. In China, Yasuo Fukuda’s visit to the memorial has been well-received. It is pointed out, however, that, first, he is already the fourth former Prime Minister of Japan considering it necessary to take this step, and second, the official leadership of Japan has still never visited Nanjing. In the author’s opinion, even this year Shinzo Abe could decide to do it. That would become an enormously important signal of the irreversibility of the positive development between the two Asia’s leading powers. The Chinese newspaper Global Times notes the emerging tendency of both countries’ governments to promote business cooperation of private companies in third countries. This is especially notable against the background of the very recent, tough struggle between Tokyo and Beijing to realize the project of constructing a high-speed railway in Indonesia. In Beijing, they furrowed their brows after Shinzo Abe and Taiwanese President Tsai Ing-wen exchanged messages in Twitter related to the destructive earthquake in Osaka that occurred on June 18. Just a few days later, Japanese Minister of Foreign Affairs Taro Kōno expressed dissatisfaction with China’s continuation of underwater hydrocarbon extraction in the East China Sea without waiting for the completion of bilateral discussions delineating the zones of economic activity.